Pokémon has another official new mobile game that isn’t Pokémon GO – it’s a strategy battle game called Pokémon Duel where you collect virtual figures and fight them in an attempt to take over territory from your rival. The Duel element involves actually battling your figures, which you can select in teams of six. These individual Pokémon have stats, including how many steps they can move in a turn, and different attacks. You can use your figures both to defend your territory and to attack the enemy’s. This is a free game, but as you might expect, there are in-app purchases that can help make you more likely to succeed; you can use “plates” to boost your Pokémon’s powers, for instance, as well as Boosters, and you can trade currency earned in-game for new Pokémon. There’s also a league play mode that lets you compete with real human opponents at any time from the home screen. Those figures look an awful lot like Nintendo’s Amiibo, the NFC-enabled figures that work with games on the Wii U and 3DS, as well as on the upcoming Switch, but no compatibility with those real figures are announced yet. You can grab Pokémon Duel on either the App Store or Google Play now, and get to battling. 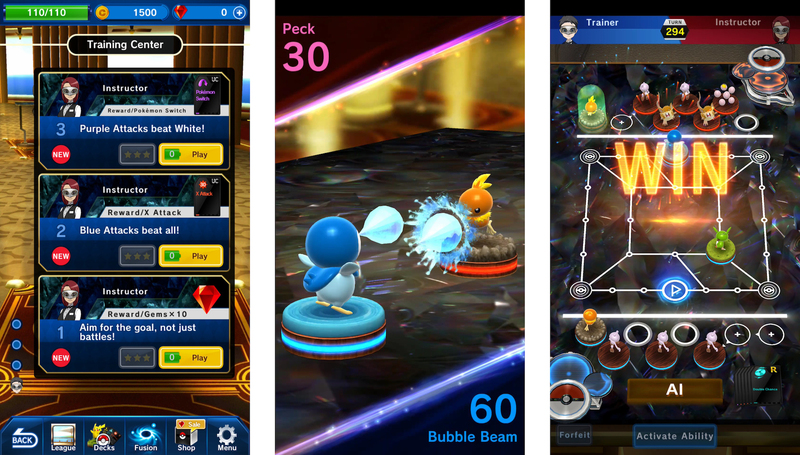 It’s a very different take on Pokémon than either the main series or Pokémon GO, but it takes a lot from card battlers and tactics games, which sounds like a winning combo.